located at Fairchild Air Force Base, Spokane, Washington. ballistic missile sites surrounding Spokane. Aerial view of site #7 near Wilbur Washington approximately 65 miles west of Spokane. Lower center is the guard shack and electronic gate. The shack was manned 24 hours a day by armed APs (Air police). When we left Fairchild we were given a password and a duress word, in case someone hi-jacked us. The password was given to the guard to gain entry to the complex. To gain entry to the underground site you would pass the guard shack, bear to the left and then turn down the ramp toward the missile entry door. It was like a BIG garage door. At the bottom of the ramp on the right was the personnel entry door. You would enter an area a little larger that a phone booth called the entrapment area. The crew commander would then electronically lock the outside door from the launch operations room. At this point you were trapped in between the two doors. There was a phone and a TV camera there. You would call the crew commander and again give your password and show your badge. If he was convinced that you should be there he would unlock the inner door electronically to give you access. Picture of one of the missiles being transported to Site # 3 in Worley Idaho, about 30 miles east of Fairchild AFB. We always drew a crowd when we moved one of the missiles. Note the airman looking out from the cab in front of the wheels. This was for rear wheel steering, like a hook and ladder truck. There was a cab on each side of the trailer. Another picture of the same move to site #3. Rear view of the missile showing the covered rocket engines. View inside Launch Operations Room. Launch Control Console is in foreground. Typical Combat Crew. Standing left to right Capt Richard Barry, Missile Combat Crew Commander, SSgt Bill Mooney, Ballistic Missile Analyst Technician (This was my job), A2C Arthur Huber, Electrical Power Production Technician. Kneeling left to right, A2C James McLaurian, Missile Maintenance Technician, 1st Lt Eldon Wilford, Deputy Missile Combat Crew Commander. To the far left of the crew is file cabinet with red drawers containing dual secure safes with Emergency War Order codes and launch documents. The tall cabinet is a high speed cryptographic receiver/printer to receive coded launch orders. Close up of a Launch Control Console. Doesn't look very complicated to launch a missile. To prevent an accidental launch or an intentional launch by a single crazy person the Combat Crew Commander had to turn a switch here and the Deputy Combat Crew Commander had to turn a switch in a far part of the building within a couple of seconds. Often launches were initiated by the base, as a practice, and the crew would proceed as if it was real launch up to the point of no return when the launch would be called off. View of the part of the living area with kitchen to left. Launch crews would come to the site in the morning after a briefing at the base to relieve the crew on duty. They would spend 24 hours at the site until they were relieved by the next crew. This rotation went on non-stop for five years until the squadron was de-activated. View of the kitchen. Note loaf of Wonder bread on top of the refrigerator. View of the two diesel generators inside to power room. The site could be totally self sufficient. View up from the Launch Operations Building of 120-foot length/8 foot diameter utility tunnel to the Launch Service Building. View of the Control Group "Logic Racks" (computer). These are the computers would control the missile launch. My job was to keep these computers running at all times so they would be ready for a launch. Note the sign on top of the racks ("two man concept mandatory"), you could never be here alone. At least two men were required here at all times. The theory being if you could figure out the logic here you might be able to launch the missile. View of the missile from the front looking toward the back in the missile bay. The missile was hanging there on the yellow framework on the top of it. The framework would lift the missile into a vertical position for a launch. Most of the missile that you can see here are two tanks, one for fuel and one for liquid oxygen. The "skin" of the missile was about the thickness of a dime. If was held in shape by air pressure. After it was raised the fuel and liquid oxygen would be loaded. You can just see the white reentry vehicle in the upper left hand corner. It contained an OW-38 thermonuclear warhead. Missile on display at an air show at the base. Another view of the missile and transport trailer at the air show. No warhead here. 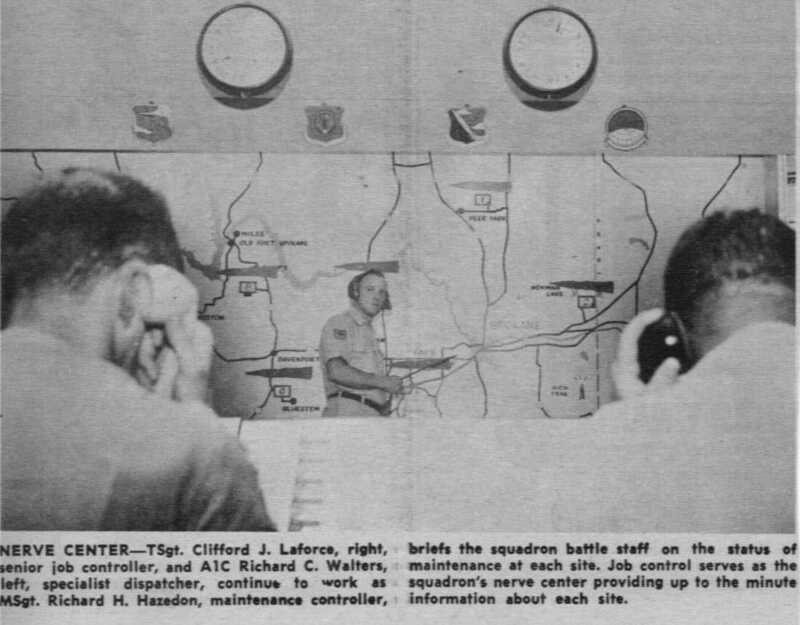 View of the base command center complete with "red phones". View of a missile during a fuel loading exercise. The poor farmers in the area always got concerned when the missile was raised, thinking that we were at war and that the missile was on its way to the USSR..
Each of the missile sites were represented by the outline of a missile at the location of the site on the map. They were usually all green meaning ready to launch. If there was a problem they would be replaced by a red missile. This didn't happen very often and heads would roll if it stayed red too long.